I've accepted a position on Esri's education team. I'll start in July focusing on MOOCs and universities. Unfortunately, I will miss the Esri Education GIS and User Conference this year. Thad J. Dymkowski, GISP, an instructor at Central Connecticut State University, answered a few questions about that school's GIS certificate program, which I mentioned last week. 1. I do not see any mention of programming, though I do see the creation of Web apps in the third course. Is there a programming component? 2. What software is used beyond Esri’s? I only see Esri. GIS software (general) is covered in course 1 highlighting all the major companies and organizations on the market, in addition to open source software throughout the program. Course 2 covers open source GIS in further depth and specifics with nods given to QGIS, uDig, and a few others. Because of its prevalence in the industry, Esri is the foundational software used in the course. 3. Can you explain the hybrid teaching model used? The whole program is billed as "hybrid" due to the mix of on-campus and on-line. For courses 1 and 3, students are required to meet on campus four times (roughly once a month on a Saturday) for approximately five hours. The remaining six weeks are on-line only allowing them to work on their schedule at their pace in the comfort of their own location - home, office, beach, anywhere they have an internet connection. Course 2 is completely on-line, with the option to meet upon request on-campus. This has been invoked by students a couple times but attendance is not required. 4. Can you talk about the value of the Saturday in-person classes? What happens at these meetings? The Saturday classes provide the students with that incredibly valuable face time with the instructor. It involves an informal lecture/class discussion to cover new class content, opportunities to ask questions and gain clarification on particularly challenging topics, time for demos and to work on assignments with the instructor. The benefit of having that one-on-one time with an instructor gives them the chance to address any issue they are having and discuss with fellow students their thoughts and opinions on the material. 5. Is there anything else you want to mention that makes the CCSU program unique? The CCSU program was based on the federal government GIS education model, in addition to lengthy discussions with successful working GIS professionals. It is taught logically with a practical application approach. It is more than teaching them what buttons to push, "buttonography." The students learn the "why" as much as the "how." All too often, GIS education is focused on "click here to do this. Then click this to do that" with minimal supporting information on why the chosen process is done, or the specific tool is used. I try to get students to think beyond the menial tasks we perform, and more about what they are trying to achieve, that is, the final goal. In addition to the technical side of GIS, we also cover topics in GIS administration, ethics, and qualitative subjects such as accuracy vs. precision, the art of cartography, and GIS history. The program is incredibly well rounded in the topics covered with significant depth and concentration on practical applications. There are two new courses in the Penn State Online programs; the content of both is under an open education license, but is not yet available. The GIS for Health Analysis course covers outbreaks, clusters, access, and more. The 3D Modeling and VR course introduces "emerging topics at the interface of concepts and tools that capture/sense environmental information (e.g., LiDAR) and concepts/tools that allow for an immersive access to geospatial information (e.g., HTC Vive)." Ben Sullins announced a course back in May on PluralSight: Geospatial Mapping in D3. If you read this far, you probably want to to subscribe! Get this GIS education update free, via e-mail, every Thursday! University of Iowa faculty, students and state archaeologists are exploring and mapping "beer caves" under Iowa City, using LiDAR. The manmade caves were used to ferment and distribute beer in the second half of the nineteenth century. Raphael Heath, who created recent GIS Day events such as Ash Cloud Apocalypse (2015) and Map Off (2016), received a Silver Award for outstanding use of technology in education in the Pearson Teaching Awards. In Nagpur, India, planting trees at school has a new requirement: GPS mapping. The government has asked the education department to map every new plant (20 per school at thousands of schools) There's some pushback, but I'd say it's an opportunity for teaching and learning! The local paper profiles mother, National Guardsperson, geography major and NGA hopeful Guisel Marmolejo from Souther Illinois University Edwardsville. Dr. Anne Whisnant is deputy secretary of the faculty and adjunct associate professor of history and American Studies at UNC Chapel Hill. Her teaching, research, consulting and writing focus on public history, digital and geospatial history, and the history of the U.S. National Parks. 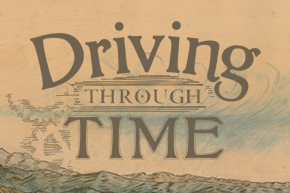 She's developed a digital humanities portal about the Blue Ridge Parkway, Driving Through Time. There's more about her work in an announcement of an upcoming talk. ACT | The App Association on Monday released a story map of unfilled software programming jobs in the U.S. The coverage of the map and corresponding report seem to about creating more computer science education, rather than finding people jobs. Jody Garnett and Anthony Calamito from Boundless detail the flexibility of open source licensing in a new blog post. You may have read about an app called I SEA, a geospatial crowdsourcing tool that promised anyone could help save Mediterranean migrants. One of my trusted Twitter contacts posted about it. It turns out it doesn't work at promised since it can't provide the detailed or timely images required for such a task. Popular Science provides details for instructors who might wan to explore this situation, which is a teachable moment. Back in March I noted that Achieving the Dream was supporting a foundation-funded effort to offer new degree programs at community colleges based on open educational resources (OER). There was talk about a proposal focusing on GIS, but that didn't happen. What did? Thirty-eight schools got grants but the press release doesn't detail toward which degree programs the money will be spent. It does suggest that in at least two schools that use OER, the use contributes "to better grades, higher course completion rates, and faster degree completion." I'd like to see the studies on which that statement, from Glenn DuBois, chancellor of Virginia’s community college system, is made. There is supposed to be research based on the implementations of OER, including work by SRI International to "evaluate the initiative and conduct research on how OER degrees impact student success and the institutions providing them." Testing enrollment begins July 1 for all three USGIF Universal Certification exams. The National Geospatial Technology Center of Excellence, also known as the GeoTech Center, has selected Esri education manager Joseph Kerski as the recipient of its third annual Lifetime Achievement in Geospatial Two-Year College Education Award. Sambus Geospatial Limited (SGL), distributors of Esri software and solutions in Ghana, Nigeria and Gambia, donated ArcGIS Software valued at $500,000.00 to the University of Energy and Natural Resources (UENR). The university has three campuses in Ghana. This upcoming Esri Education GIS Conference has some 700 registrants. h/t Michael Gould. Your GPS Is Making You Dumber, and What That Means for Teaching - Is the GPS step-by-step instruction paradigm the best way to teach math and other topics? The author says no. The Top 10 Companies Working on Education in Virtual Reality and Augmented Reality - The terms "field trip" and "museum" come up a lot. We Shut Down Our Edtech Startup. Here’s What We Learned. - Why making money in edtech is hard. Congratulations on your new position Adena! I'm sure Esri is pleased to have you on board. Adena, I'm excited to hear you'll be on the Esri education team!